First published in 1951, The Catcher in the Rye by J.D. Salinger is now generally accepted as a masterpiece of American fiction. It is the tale of coming of age even as it presents us with a character who absolutely refuses to come of age. The character having the outsider status and disaffection as the protagonist and narrator, Holden Caulfield, has become the literary image of the social outsider. The novel has been frequently challenged and banned for its use of profanity, harsh language and references to sexuality. Even still, it remains the required reading for introductory courses in 20th century American literature. The protagonist of the novel is seventeen-year-old Holden Caulfield. Directly addressing the reader, Holden lets us know that he is currently in a mental hospital or sanitarium somewhere in Southern California. He explains that he wants to tell us of the events which took place the previous December over two days. At this point he digresses, something he is prone to, and tells us about his older brother, D.B. He tells us his brother was once a terrific short-story writer before he sold out and started writing scripts in Hollywood. The remainder of the novel unfolds as a series of memories from the narrator. Holden attended Pencey Prep School. This is an exclusive private school in Pennsylvania. One afternoon at a football game between Pencey and their traditional rival, Saxon Hall, Holden tells us that he missed the game. He was the manager of the fencing team but somehow lost the team’s equipment on the subway that same morning which resulted in the cancellation of a match in New York. At this point, Holden is on his way to the home of his history teacher, Mr. Spencer. Holden wants to say goodbye since he has been expelled from school and will not return after the Christmas break. Spencer, we find, is a well-intentioned but tiresome old man. After Spencer scolds Holden for being expelled, Holden leaves and takes refuge in the largely abandoned dorm back at school. Holden puts on his red hunting cap and begins to read. Soon he is disturbed by his neighbor, Ackley. Holden then gets into an argument with his roommate, Stradlater, over a theme Holden wrote for him on the subject of Holden’s dead brother Allie’s baseball glove. Stradlater, it turns out, is also dating Holden’s ex-girlfriend Jane Gallagher. Having had enough of Pencey Prep, Holden takes a train to New York with the plan to stay in a hotel until Wednesday when his parents expect him to come home. On the train to New York Holden runs into the mother of one of his classmates at Pencey. The classmate is widely disliked and referred to as a rat, but for some reason Holden lies to the woman and tells her how popular her son is at school. Holden’s hotel room in New York looks out on another wing of the hotel and he watches the “perverts” from his window. Holden has his own struggles with his sexuality. At the hotel he meets three women in their thirties who are visiting from Seattle. Holden has a good time dancing with them in the hotel lounge, but the women end up stiffing him and leaving him with the check. Holden then goes to Ernie’s Nightclub which proves to be a disappointment. Later, in Greenwich Village, Holden decides to take a prostitute back to his room, but he backs out and pays her to leave. He is shocked as the prostitute’s pimp comes to his room and beats him up for more money. Holden is all but defeated as Sunday morning nearly dawns. Holden gets a short rest and telephones Sally Hayes, a girl he has known previously, to go to a play later that afternoon. Holden leaves the hotel and checks his bags at Grand Central Station. Over a light breakfast, Holden meets two nuns, one of whom is an English teacher. He has a discussion with her about Romeo and Juliet. Holden later goes shopping for a record for his sister, Phoebe, called “Little Shirley Beans.” Holden spots a young boy singing the lines “If a body catch a body coming through the rye.” This manages to cheer him up a little. Holden meets with Sally. He tells us that he finds her snobbish and phony, but they attend the play together. The play features the stars Alfred Lunt and Lynn Fontanne who are actually married. Holden and Sally go skating at Radio City, but as Holden tries to talk to her about things that really matter to him, and he suggests that they run away together, the two have a fight. Holden takes off from this exchange and goes to the Christmas show at Radio City Music Hall. After this, he goes to see a movie and ends up getting drunk. He wants to go check on the ducks in Central Park, but in the process he breaks his sister’s record. At this point, Holden is physically and mentally exhausted and heads home to see his sister. Holden tells us that he and his sister Phoebe are close friends as well as siblings. He tells her that one thing he would love to be is the “catcher in the rye,” the person who stands near the edge of the cliff by the field of rye to catch any of the children who wander too close to the edge. Later, Holden and Phoebe’s parents come home. Holden sneaks out undetected and visits the home of one of his teachers, Mr. Antolini, with the hope of staying with him for a few days. This is one of Holden’s favorite teachers. Holden is wakened in the early morning before dawn by Mr. Antolini patting him on the head. He leaves as soon as he can. On Monday morning, Holden makes arrangements to meet Phoebe for lunch. Holden tells her that he needs to say goodbye. He intends to leave for the west to live out his life as a deaf-mute. Phoebe insists on going with him until Holden relents and agrees to stay. The story ends Holden watches Phoebe ride a carousel in the rain. The last chapter of the novel finds Holden in a sanitarium somewhere in California. He explains that he does not want to tell us anything more. He says he misses everyone. The narrator and protagonist of the novel. At 16 years old, Holden is facing expulsion from Pencey Prep school for failing his studies. He is obviously extremely cynical about nearly every aspect of life and this comes through not just in what he says but also in his tone. He sees nothing but artificial posturing and ugliness in everyone around him, and he finds all of this hypocrisy to be unbearable. For these reasons he advances a cynical attitude in order to protect himself from the world. Yet, it is equally obvious that Holden’s criticisms of people are just as valid for himself. He hates his own weaknesses. He is often just as superficial as anyone else in the novel. As he is on the edge of adulthood, he seems to attempt to wander into the adult world with a sense of awareness that he does not possess and for which he is really not prepared. All of this leaves Holden in a state of collapse by the end of the novel. Holden’s neighbor in his dorm at Pencey Prep. Ackley is rude and his appearance is unpleasant. He is a major source of annoyance to Holden because he routinely barges into Holden’s room. Holden also suspects that Ackley makes up elaborate lies about sexual experiences; this is a form of pretension which Holden finds revolting. Holden’s roommate at Pencey. Holden sees Stradlater with a mixture of envy and admiration. Stradlater appears to be good-looking and popular at school. Yet, Holden reveals him to be a “secret slob” because, although his outward appearance is handsome, his grooming habits are slovenly and disgusting. Holden both admires and envies Stradlater’s sexual prowess as a student. Holden talks about Jane though she never actually appears in the novel. She is important to the extent that she is the one female who Holden is both attracted to and who he respects. Holden spent time with her over the course of one summer while their families stayed in neighboring houses during a vacation in Maine. She represents a form of love and enchantment which otherwise eludes Holden. Holden’s younger sister. Phoebe is the only character who Holden genuinely loves. She is only ten years old but she listens to Holden in a manner that appears more mature than he. She is intelligent and talented, and her innocence is one of the few things that Holden sees as honest and genuine. Though she is six years younger than Holden, she at times seems to point out Holden’s immaturity as if she were the older sibling. She can see that Holden is his own downfall. The younger brother of Holden who died of leukemia before the novel begins. He is idealized by Holden as a brilliant and the most intelligent member of their family. Holden seems to be tormented by the death of younger brother and carries a baseball glove that once belonged to him, on which Allie wrote poems in green ink. Holden’s older brother. Holden admires the collection of short stories written by his older brother, but now feels that his brother prostitutes himself by writing for Hollywood. An attractive young girl who Holden likes and is attracted to. He has dated her for some time, but he refers to her as being stupid even though she is well-read. She appears to be a conventional girl which Holden finds unappealing. One of Holden’s former teachers at Elkton Hills School. He is now on the faculty at New York University. A young and affable teacher, he is sympathetic to Holden and Holden respects him. Holden seeks him out for advice. This is from an exchange of opinions between Holden and one of his teachers at Pencey in Chapter 2. The teacher explains the way the world works and we can clearly see the contempt Holden has for both the teacher and what he is saying. Holden completely identifies with those on the other side of the game. The mere fact that life is explained as a “game” is utterly offensive to Holden. Life is not a game and those who operate as if it were just a game are the problem in life and the world. At the same time, we see in Holden’s attitude here that he has shut himself off to the world. He is closed off in his own cynical bubble and unwilling to listen to others. His teacher is giving him this advice because Holden is in fact failing out of school. This occurs in Chapter 3 as Ackley barges in and begins bothering Holden. We see Holden become defensive over his red hunting hat. The hat is a symbol of Holden’s sense of individuality. Holden sees this hat as a true expression of his difference from the herd of humanity. At the same time, we can see how defensive Holden becomes in this moment. Holden’s own internal insecurities are betrayed in these lines as he overstates his case by claiming he is going to shoot people. Holden’s beliefs are flimsy as he is confronted with a world that is not what he wants it to be. In Chapter 16 Holden visits the Natural History Museum. Here he explains the virtues of the exhibits contained under glass. He clearly idealizes the immutable things that are preserved in the museum. These things will forever remain in the state they are in and Holden sees this as an image of the perfection he so desires. It is crucial to note here that Holden switches to the second person “you” instead of the first person. In this way, he removes himself from the taint of changeable nature that he sees in others but will not recognize in himself. These lines obviously state the title, but they also encapsulate Holden’s view of life. To be the catcher in the rye is to remain the guardian of innocence forever and without ever changing. He wants to remain this guardian forever and without fail. The perfection of an image of the adult world that never disappoints or causes harm, and the perfection of childlike innocence in the children at play are all in these lines. The storybook fantasy also represents just how unrealistic Holden’s beliefs actually are. He is unwilling to confront life and his cynicism stems from his inability to be the man he wishes others could be. If anything drives Holden’s cynicism it is what he sees as the loss of innocence. He idealizes this state over all others. His dream is to be “the catcher in the rye” in which children play in a state of protected innocence and he has the role of catching them should they wander too close to the cliff and fall form innocence. His feelings toward Jane Gallagher consist almost entirely of an idealized time of a completely innocent relationship. He is at great pains to explain that there was never a sexual relationship between the two of them, and he is deeply disturbed that she may now be subjected to sexual advances from her stepfather and from Holden’s roommate Stradlater. Holden demonstrates a shift in his attitude toward the end as he realizes that Phoebe, and others, must eventually risk the loss of innocence in order to progress in life. Against Holden’s preoccupation with innocence is an equal concern over death. The memory of Holden’s dead brother Allie hangs over the novel. Holden lives with the fear that he may one day disappear just like his brother. He has haunting visions of Allie in the cemetery surrounded by images of death. Holden equates death with the inexorable movement of time as he longs for things to remain the same. He would like the inevitable changes of life to be stopped, especially when something good happens. As Holden contemplates displays under glass in a museum, he sees life itself as the specter of death. Life is the terrible change which Holden cannot accept. This is ultimately what causes Holden’s own downfall. He cannot accept the inevitability of maturity and growing up. As he longs to remain and innocent child, he destroys his own innocence, driving himself potentially insane. Holden’s cynicism stems almost entirely from what he perceives as the fake and phony ways of the world, particularly the world of adults. He despises this artificiality. The latter is what fuels his resistance to adults and growing up. For these reasons he idealizes childhood. The innocence of children is authentic to Holden. It has not been tainted by pretense. When Holden sees the child singing “If a body catch a body coming through the rye” he sees an authentic expression of real feeling rather than an artificial display designed to amuse others. As opposed to this, Holden is offended by the fact that his brother writes Hollywood scripts. He hates when Ernie plays piano in a club in Greenwich Village because he sees Ernie as a sellout. Holden cannot stand most Hollywood movies because he sees them as sentimental and manipulative. Even in reading Hemingway’s A Farewell to Arms, Holden recognizes that the novel is critically acclaimed, but he thinks it is artificial in its aim and therefore not authentic. All of Holden’s attitudes toward what he usually perceives as inauthentic are tied to his mistrust and dislike of adulthood. The image of the prep school embodies all of Holden’s attitudes. The prep school veneer of perfection that conceals a world of inconsistency and hypocrisy is the primary symbol of all of Holden’s attitudes. Even the way the schools are advertised are a lie to Holden. Holden explains that Pencey Prep shows a guy riding a horse performing great feats of equestrian prowess, while Holden states that he has never even seen a horse at Pencey Prep. The schools claim to transform boys into ideal men, when in fact they are filled with bullies and liars like Holden’s roommate Stradlater who has Holden write his English theme paper. Stradlater appears as the perfect prep school student, while he is a womanizing cheat. He succeeds because he is good looking and charismatic. These qualities as all a matter of appearance over authenticity. The prep school is the image of this antagonism. The baseball glove is a symbol of Holden’s attachment to his deceased brother. What is more, the glove functions as a general symbol of loss. Allie wrote poems in green ink on the glove so he could read them on the field when he was bored. This stands out as an image of real and legitimate feeling for Holden, authentic feeling that is lost now. This small item is an expression of individuality to Holden. Precisely because it is not fashionable Holden believes it is a real expression of who he is inside. The authenticity he ascribes to the hat is mocked by Ackley and this reveals Holden’s tenuous belief even in his own ideals. The novel first appeared as short stories in Collier’s Magazine, December 1945, and in The New Yorker, December 1946. 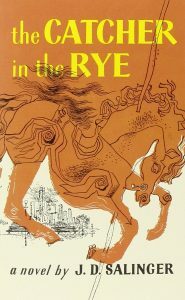 Often referred to as a “coming of age novel,” the book nevertheless resists that description to the extent that the primary conflict in the novel involves Holden Caulfield’s inability to actually come of age. J.D. Salinger wrote a series of short stories after the publication of Catcher in the Rye. These were met with critical disdain and Salinger became a recluse. Even as his book became more of a popular and critical hit, Salinger removed himself further from the public. He died in 2010 leaving hints that he had continued to write. Catcher in the Rye is one of the most challenged novels in American literatures. It has been banned for being part of a communist plot, for the frequent use of profanity, and for sexual situations. Unfortunately for those who have sought to ban the novel, this notoriety as done nothing but drive continued interest in the book and partly boosted its continued popularity with readers.